The status defines different project states and degrees of completion. You can find the project status in the project, on the Management page, in the Schedule area. Create a new project status by clicking New. In the New Project Status dialog box, enter a name and a progress (in %). The progress is a percentage figure, i.e. an integer between 0 and 100. Edit the existing project status. Choose one status from the list and click Edit. 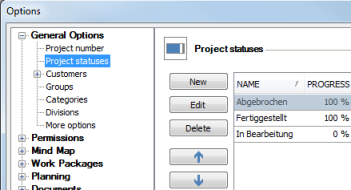 Remove the selected project status from InLoox PM by clicking Delete. You can change the status position in the list. Click Arrow Up to move it upwards or Arrow Down to move it downwards in the list. The project statuses list contains the name and progress of each state. The sequence of this list corresponds to the sequence displayed in the projects, on the Management page. Changes to the state (e.g. name, progress in %) take immediate effect in all relevant projects. How to edit the project status | InLoox PM 8 • Copyright 1999-2019 © InLoox, Inc. All rights reserved.